Probably one of the most unique roguelikes around, HyperRogue has such a mind-bending world it's really quite something. See my previous thoughts here. 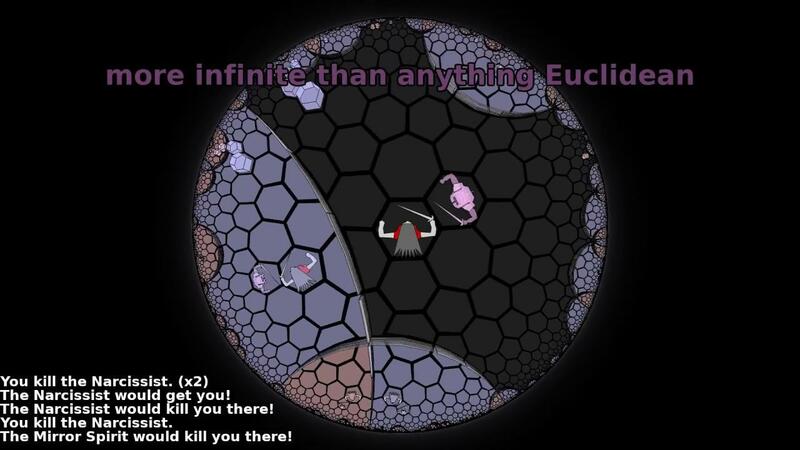 Taking place in a non-Euclidean world it can be a little confusing and it certainly is a difficult game. I've never managed to get very far from it, but it's so incredibly interesting it's a game I regularly come back to just to explore some more. Recently, version 11 was officially released adding in three entirely new lands to explore, new geometries and projections, new music and a few more little improvements. There's quite a lot to take in, even though it doesn't sound like a great deal, so I do recommend reading their blog post on it. For those doing some gaming on the go or you simply don't have a powerful gaming PC, it's a good bit of low-end gaming that will keep you occupied for hours. You will get lost, confused, amused and perhaps a little dazzled but it's well worth a look. I could go on for a long time about just how weird and interesting it is, I've got a lot of hours in it now and I still find the experience hard to fully describe. Find it on the Official Site, Steam and itch.io. You can also grab an older version to try out for free, which is pretty sweet and the source code is on GitHub. This is a remarkable game from a mathematical view. I don't generally play rogue-likes, but my love of hyperbolic geometry was strong enough that I bought this a while ago. It is worth the money just for the introduction sequence showing all the different hyperbolic projections. The game is pretty weird and fun, too. It is cool that they are still adding to it. I need to go back and take another look.